I’m a big fan of the Caesar salad. The tangy homemade dressing, the crunchy croutons, the salty flavor of Parmesan cheese. So how is my recipe different from all the others? Romaine lettuces are drizzled with olive oil, then seasoned with fresh cracked pepper and grilled until warm and slightly charred. 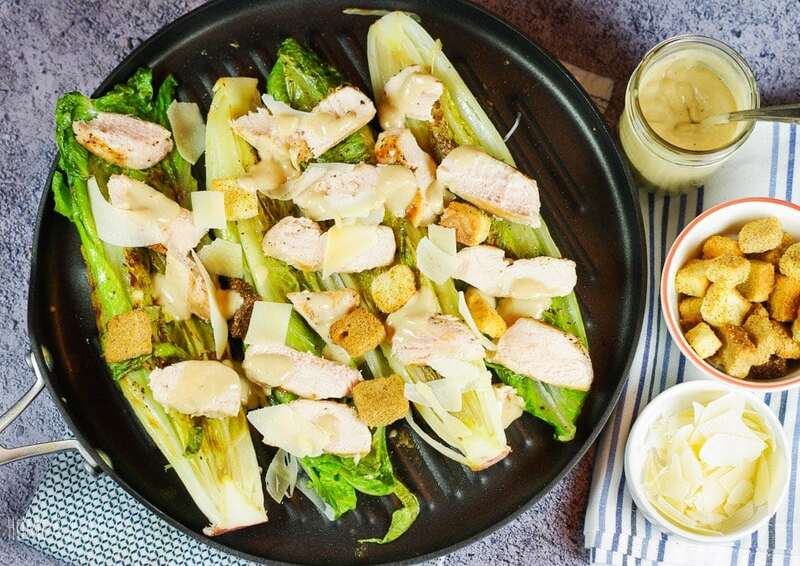 Then the lettuces are topped with grilled chicken and served with a robust homemade Caesar dressing. 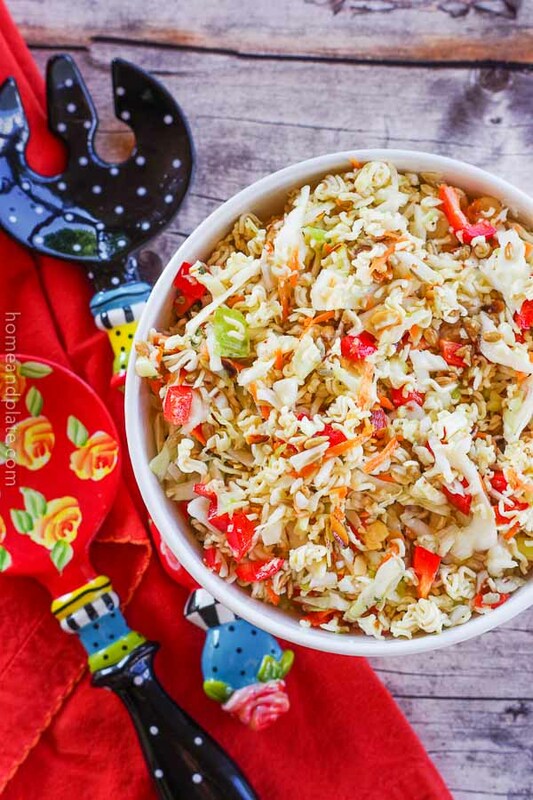 This classic salad will become a family favorite in no time. 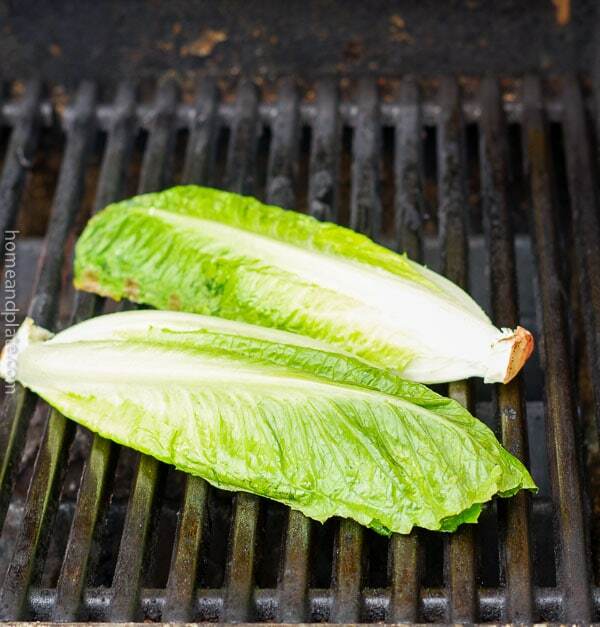 This is a great recipe for warmer temperatures during grilling season because the lettuces go directly on the grill. But this recipe can also be made indoors using a skillet grill or Panini pan in the winter months. Lettuces may seem like the last vegetable you would try to cook on the grill but it really imparts a delicious smoky flavor and tastes wonderful. So why not try it indoors! Using a skillet grill pan gives the lettuces those grill marks you’re looking for. Whip up my fresh Caesar dressing to go along with the salad. If you’re squeamish about raw eggs, luckily there are none in my dressing recipe. And while you may be adverse to anchovies, mincing and mashing them into a paste before adding them to the dressing changes the flavor from fishy to fantastic. Even my husband had no idea there were anchovies in the dressing. Had he known ahead of time he probably would’ve chosen a different dressing from the refrigerator. It’s that’s good, I promise! Have you ever grilled lettuces? Will you get this recipe a try? 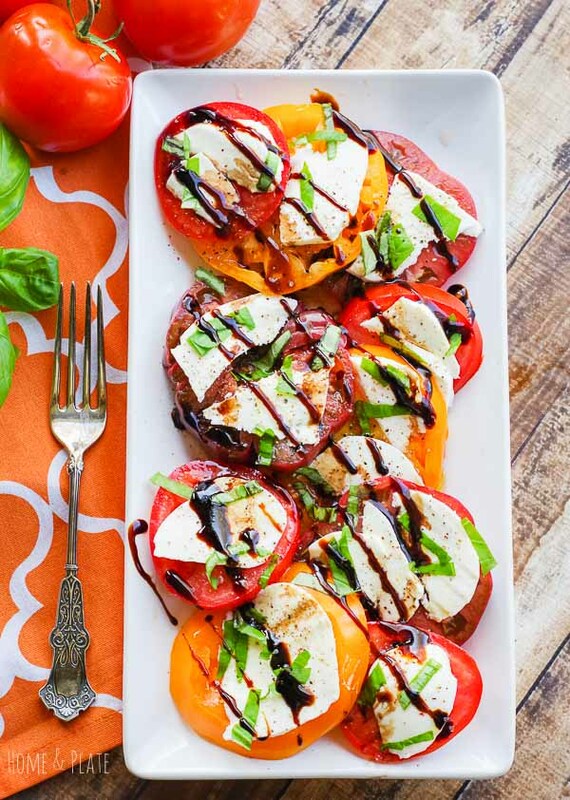 Pin this recipe to your Salad Board! 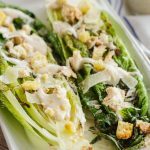 Grilled romaine hearts take on a smokey flavor and are delicious with a drizzle of my homemade Caesar dressing. To make the dressing use a glass bowl. Add together all the ingredients but the olive oil. Using an immersion blender, blend the ingredients then slowly stream in the olive oil to fully emulsify. Transfer the dressing to a small pitcher or mason jar. Season the chicken breasts with a drizzle of olive oil and a sprinkle of salt and pepper. Preheat your grill to medium if grilling outdoor and grill they chicken until cooked through, about 8 minutes per side. To make this recipe indoors, add the chicken breasts to a large Panini pan and cook for 4 to 5 minutes per side at medium heat or until the chicken is cooked through. Remove the chicken from the pan and slice it into long strips. Season each romaine lettuce heart half with kosher salt and pepper and drizzle with olive oil. Place each lettuce half directly on the grill or in a Panini pan and cook on the stovetop at medium high heat for about 3-5 minute. Remove the lettuces from the grill or pan and arrange on a platter. Top the lettuces with the grilled chicken, croutons, Parmesan cheese and drizzle with the homemade dressing. Be sure to refrigerate any remaining Caesar dressing. What a wonderful, light salad. Perfect for this time of year. The grilled romaine fits right in with the grilling season that is not too far away! Sounds and looks delicious. Totally agree with you. Thanks Chris. I must try making my own caesar dressing. It will be handy since I often have salad for lunch. It’s so good…hope you like it. 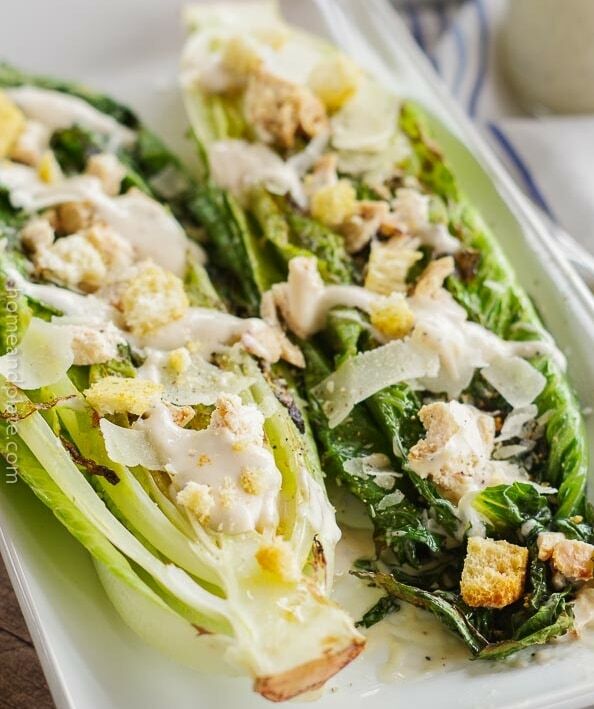 I love the idea of grilled romaine — and the dressing sounds extra tasty! It works great indoors too. You should give it a try. That caesar dressing looks absolutely delicious! Need to try! It’s so tasty Marsha. You should definitely give it a try. 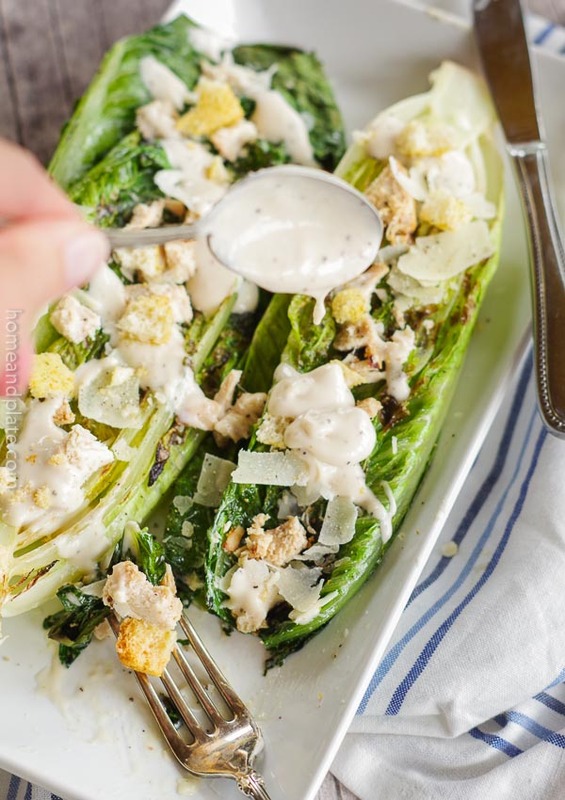 I love grilled Lettuce AND Caesar dressing, sharing and pinning! I haven’t tried making Caesar dressing yet.. I’ll have to try!!! Yes….do try Sarah…the flavor is amazing and so easy to whip up. Hope you like it.